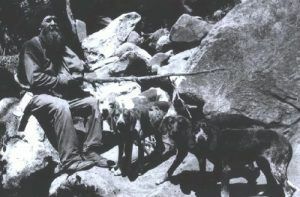 Ben Lilly usually hunted with hounds. The cascading notes of Ol’ Lilly’s hunting horn were some of the signature sounds by which he was known, as peculiar to the man as the recognizable songs of his mixed-breed dogs. It could be said that throughout his life, he was a man more relaxed and intimate with wild places and his faithful, panting canines than with any friend or wife. Benjamin Lilly was one of the greatest hunters and most fascinating characters of the quickly civilizing West. He dressed like a mountain man, preferred sleeping outdoors to a proffered room and bed, and would sometimes walk hundreds of miles in pursuit of a single elusive bear. From childhood hunts in the 1870’s until his death in the latter part of the 1930’s, Mr. Lilly was what we’d now call an “anachronism:” a man still inhabiting an earlier time– and in many ways, the last of his kind. Ben was an unrepentant atavist, a proud throwback, a devout adherent to archaic ways of being that he believed to be more meaningful and heroic. Or at least more tolerable…. and more vitally experienced! Ben was known far and wide for his incredible stamina when walking or running. He carried only the barest essentials in his surplus pack, with no more bedding than a wool blanket and a tattered canvas tarp. When he philosophized that “Property is a handicap to man” he wasn’t proposing some socialist manifesto, but rather, a recipe for camping light! Long before beatniks, hippies and punks– Ben Lilly preached the importance of owning little, so that our things don’t own us. He preferred liberty and free time over possessions he couldn’t carry on his back, and eschewed anything that required constant maintenance and thus a sedentary life. Lilly was a latter day Daniel Boone in his canvas pants, brogans and coonskin cap, packing a Winchester 1886 or 1894 rifle and a huge handmade knife. Like Boone before him, he endlessly sought out new vistas and challenges, in an attempt to escape the population density and social propriety that his relentless hunting of lions and bears had actually helped make possible. He lives on as a larger-than-life legend among the rural folk of Louisiana, Texas, New Mexico and Arizona…. and particularly among the individualistic residents of the Gila National Forest where he hunted throughout the latter half of his life. Only recently have the last folks died who could remember having met Lilly, and their children and grandchildren continue to be the keepers and tellers of his timeless tale. He was not merely blowing his horn, but hearing and heeding a call. It’s said that some people are born “marching to a different drummer,” leading them in a different direction than the vast majority of their civilized kind. They may be legendary heroines or salty folk heroes, long forgotten heretics or anonymous hermits ensconced in their howling caves. And even Jesus needed forty days and forty nights in the wilderness– away from the prattle and preconception of village life– in order to fully experience the truth of self and the reality of God. A few such fringe-dwellers have managed to earn the accolades or acknowledgment of their society through some combination of ability, fortune and circumstance: Intemperate military officers, whose disobedience of official orders somehow results in his army’s victory, in what turns out to be a pivotal fight. Women with besmirched reputations and incorrigible attitudes, who prove their mettle during a siege by “Red Leg” guerillas or a frontier cholera outbreak. Individuals who are just warming up when others are already running from the heat. Courageous leaders and founders of important social, religious and artistic movements, who started out the kinds of kids that not even the strictest schoolmarm could make sit still in their seats. They are often the last to give up the olden ways, and also the first to try something strange and new. They may laugh or cry a little more freely than others do– or else stubbornly cling to silence, and tightly cleave to solitude. Their fevered allegiance to a calling or a way of being has always come at a cost, be it misunderstanding, oppression or neglect. Among Native American tribes such personalities were highly valued as soothsayers, healers, teachers and agents of Spirit during moments of crisis…. but the remainder of the time their wild eyed intensity could be just a little too much for their brethren, resulting in medicine men and shamans usually setting up their lodges at the extreme outer edges of any village or camp. The Buddha would have died unknown and been viewed as crazy while he lived, if no one had taken the time to really listen to him. Joan of Arc may have been an “emissary of the Lord” and bore his ring, but she avoided the fire only so long as she served the interests of church, state and king. Sioux warrior Crazy Horse was honored for his brilliance and excess during that tribe’s frequent battles, but few people wanted to sit and have tea with him in the peaceful weeks or months between. The pundits, party goers and power brokers of Washington DC found famed Indian-fighter Davy Crocket entertaining– but also crude, odoriferous and overbearing. And oddly enough, the issue that put an end to the famed Indian-fighter’s career as a U.S. Congressman, was daring to object to President Jackson’s policy of forcibly removing Indian tribes from the land of the ancestors who lived, loved and died before them. Ben Lilly was just such a man, neither noble nor licentious, but authentic to a fault. He was in some ways closer kin to the lions and bears that he hunted than either the settled country folk who adored him or the government men who eventually paid his wage. Like those other furry beasts of the forests and deserts, it could be said that the always bearded Ben Lilly was cut from a wilder cloth. The early Greeks would have called this “something agreeable” the “anima mundi:” the palpable energies of the planet itself, and the native spirit of place. For Lilly it was simply an unfathomable incarnation or creation of an obviously outdoor-loving God. Truly, the land was as a bodily extension of Ben’s being…. even if he seemed to sometimes treat his other affiliated parts– his fellow creatures– coldly or harshly. At the same time that he was making his living by killing, the hyperawareness of the hunt brought him deeper into awareness and celebration of all life. He understood how blue jays and tree squirrels functioned as aids and agents of his own physical senses, alerting him to the movements of both people and game. He learned to hear through the ears each region’s animal sentinels, and to see through the eyes of its watchful birds. The fields, hills and hollers were more than pretty scenery or an opportunity for outdoor recreation– more than a stage for the acting out of an individual’s personal dramas. Lilly viewed nature as an unfolding lesson, as a book that any man could read and understand if he only took the time to pay attention. And as a sermon, and solution. As the challenge, and the reward.